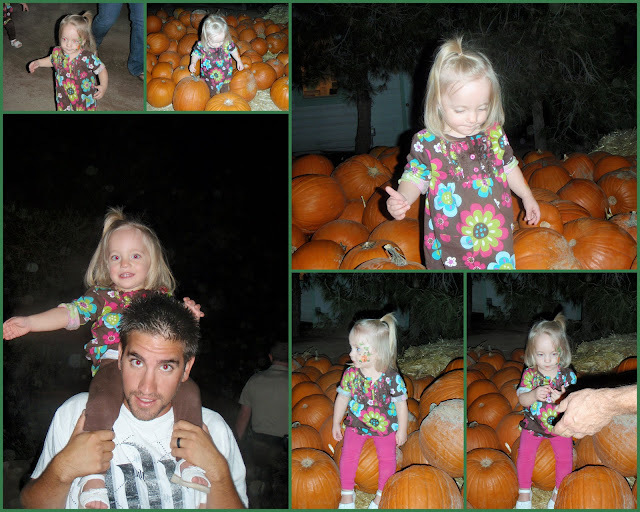 This past weekend we took the girls to their first pumpkin festival. It is so much fun to take them to new places as they grow. We all had a great time, so much that we have decided to make it an annual event. The girls got pumpkin paintings. Naturally, Ava being a little timid of the man doing the paintings, he decided to put in on her arm. Adisyn didn't mind so she got hers on her cheek. The girls went on their first carousel ride. They both loved it! Just before the carousel started moving Adisyn spotted two dogs just outside the gate and immediately wanted to go say hi. They have an obsession for dogs! As the carousel started moving I said to her " the dogs are going bye-bye". Well that was the WrOnG thing to say, she started histarically crying, which fortunately didn't last long. They had a great time! We took the girls to the petting zoo area. 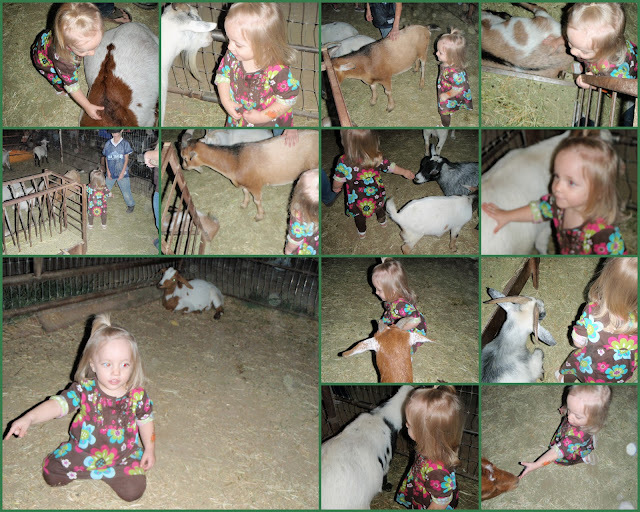 Strangely enough Ava absoultely LOVED the goats. She didn't want to leave. She even gave a few lucky goats a kiss. Adisyn on the other hand wanted nothing to do with them! 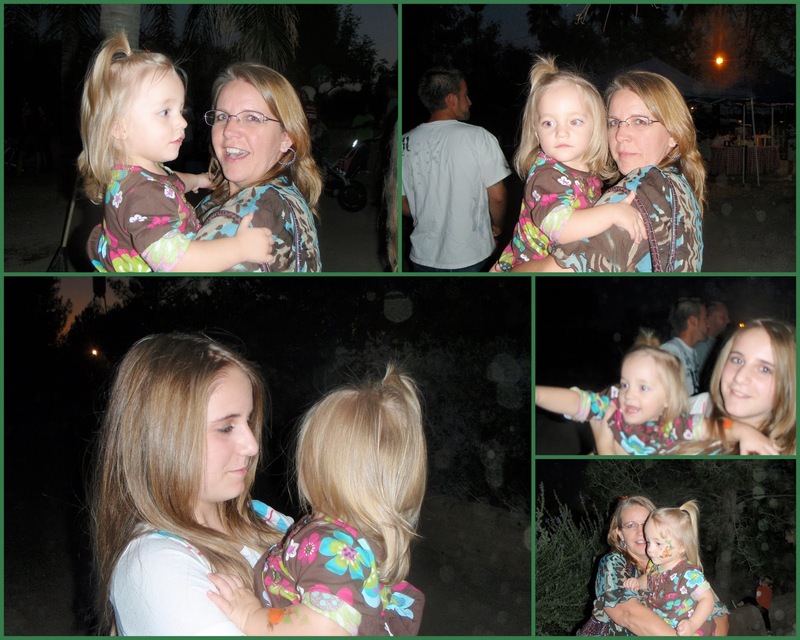 She clung to Grandma and wasn't going to let go for nothing! Pumpkins everywhere! Adisyn loved the pumkin that she got from Grandma! Of course DJ's mission: Find the biggest pumpkin you can! My brother DJ and sister Katy! We decided to go through the corn maze. Not gonna lie it was a little freaky but lots of fun. We took some souvanirs home with us! The girls love corn on the cob, what can be fresher than picking it ourselves. Fortunately for a change we were only minutes from home. We were all exhausted by the end of the night. The girls fell asleep in the car and gave up no fight when it was time to hit the crib. On a side note we are proud to say that we are a bottle less home! The girls have gone a week with no bottle!!!! yah Girls! You have the cutest little girls!! It sounds like the festival was fun, would you reccomend it to RJ and I to go for a day and get our pumpkins or is it more for kids? I really want to check it out!